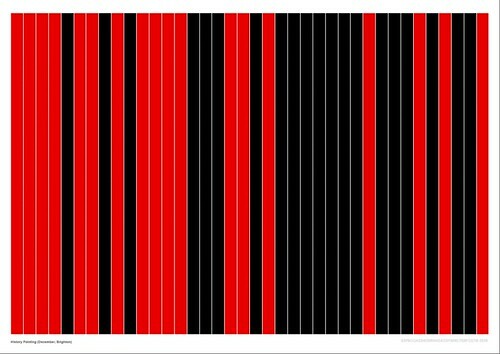 Keith Tyson's 2004 project History Paintings comprised fifteen paintings, each with 49 vertical strips of powder-coated aluminium in black, red and green - the colours of a roulette wheel (Tyson has always liked gambling). The three larger ones are reconfigured each time they're shown. The dozen smaller ones are tied to the months of the year. Michael Archer (of both Ruskin and Guardian) wrote: "In their bringing together of time, geography and randomness, the History Paintings address the question of how the individual relates to, participates in and attempts to make sense of historical events." I'm not quite feeling that, much preferring his scrappier drawing work from years previous, but they look ok.
A couple of days ago, Tyson did a spin-off (or spin of the wheel, we might say) project with The Guardian: a free edition of 5,000 pdf files, each delivered to the website visitor as a customised file. 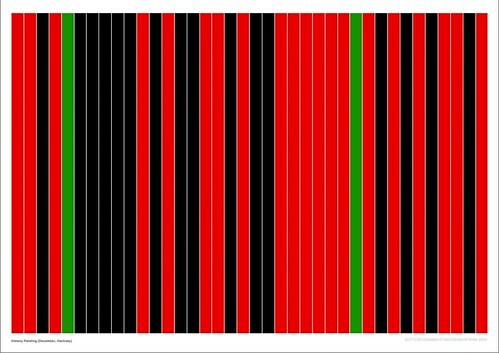 The arrangement of the coloured strips is partly determined by the location typed into Tyson's website: you can't tell if each is unique, or merely potentially-unique. Once experienced as the flat colour of a downloaded PDF file on your desktop - rather than as photographs of aluminium - the image hints at the bureaucratic ephemera of public transport and tube diagrams. 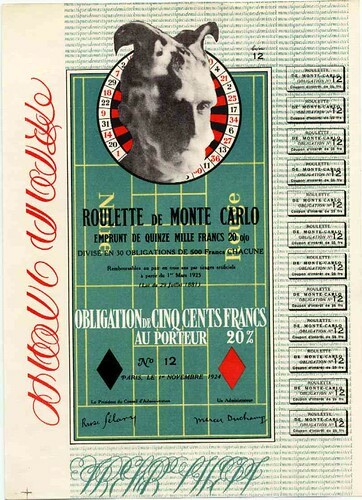 Another aside: they immediately recall Duchamp's imitated/rectified readymade Monte Carlo Bond of 1924: an unfinished collaboration between Duchamp, his alter ego Rrose Sélavy and Man Ray, an art-financial work that parodied company stock certificates and speculative get-rich-quick schemes. "The annual income is derived from a cumulative system which is experimentally based on one hundred thousand rolls of the ball; the system is the exclusive property of the Board of Directors" its verso proclaims. Of course, it never achieved his aim of breaking the bank at Monte Carlo. Later editions of the same work sometimes come up: here's one of the 1938 edition for $4,000. Regardless of the dubious value of trying to dubiously value the art, one thing is immediately clear: in a reversal of casino logic, we value the rarity of the green stripe: 0, house wins. See also: Danny Birchall's Unlimited.